If we define success as the achievement of a valued or desired result or state, I think it is fair to say that we are all interested in it. Therefore it is not surprising that much attention goes into the question of how we may achieve success. Many books and articles have been written about how to become successful as individual or how to build and sustain successful institutions. In other words we are very interested in finding out what are the determinants of success. Although less attention seems to have gone into the question of what are the effects of success this may be every bit as important and interesting. Here is a brief exploration of that topic. Most of us are probably familiar with the so-called Matthew effect. Sociologist Robert Merton (1968, 1988) used this term to describe the effect that eminent scientist tend to get more credit that lesser known researchers for equal performance. The Matthew effect was based on a line in the biblical Gospel of Matthew: "For to all those who have, more will be given, and they will have an abundance; but from those who have nothing, even what they have will be taken away." This Matthew effect, which is also known as the accumulated advantage effect, applies to many things. For instance, when one has much money or many connections, one can use these to acquire more. In his latest book, Everything Is Obvious: Once You Know the Answer, physicist-sociologist Duncan Watts, writes: "Success leads to prominence and recognition, which leads in turn to more opportunities to succeed, more resources with which to achieve success, and more likelihood of your subsequent successes being noticed and attributed to you." In cybernetic terms the Matthew effect describes a mechanism of positive feedback or self-reinforcing feedback, which can be understood as follows: A produces more of B which in turn produces more of A. In this way, a virtuous circle exists: success is a determinant of further success. In 1937 Dutch historian Jan Romein described his law of the handicap of a head start (original Dutch: wet van de remmende voorsprong) which says that being in a lead position in a particular area may lead to 1) the decline of stimuli to strive for further progress, 2) a reluctance to adapt to changes, and 3) an inability to adapt. As a result, the individual or group that was initially ahead is eventually overtaken by others. In cybernetic terms a mechanism of negative feedback may emerge which can be understood as follows: A produces more of B which in turn leads to a decline of A. In other words: the output of the system opposes changes to the input of the system which stabilizes the system. This negative feedback mechanism may become a handicap when the system's environment changes and poses higher and different requirements. 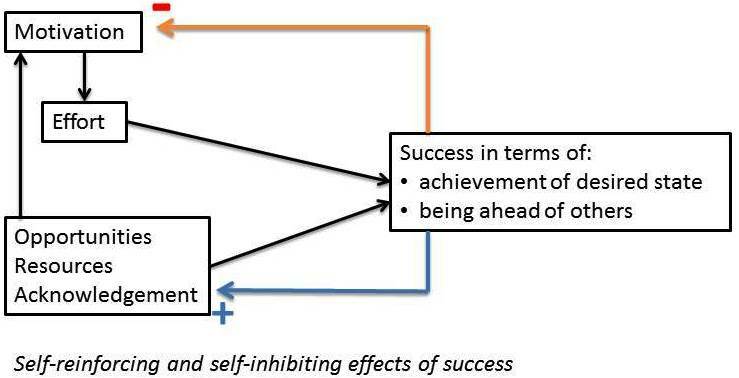 In this way, the existence of success may lead to a decrease in efforts which may undermine future success. 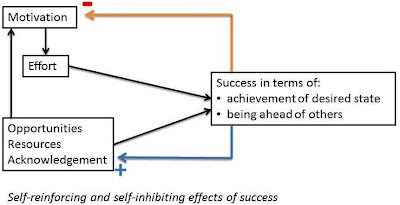 This self-inhibiting effect of success may happen only when 1) the (full) achievement of the desired state has been achieved**, and 2) when the individual, organization or country in question is ahead of others. It should be noted that it is quite possible that before these two criteria are met, success actually has a stimulating effect on motivation. My question to you is: do you think this is a valid and useful way of looking at success? Do you have evidence that what is said here is true or false? Please let me know. If you think it is false, how do you think it can be improved? It is true, how may this be used practically? * thank you to careersintheory for your useful comment to an earlier version of this post. ** thank you to Natasha Parfyonova for suggesting a change in the model (remove arrow from opportunities to effort and add one to motivation) and for mentioning Carver and Sheier's control theory of motivation. which says that motivation results from the perceived discrepancy between the current state of things (input) and the referent (or standard/ goal). When the goal has been achieved, there is no more discrepancy, which means there is no more motivation. Your model doesn't seem to include the possible positive effect of success on motivation. You may need a moderating term between success and motivation, such as ambition. If the level of success matches or excedes the individual's ambition, then it may result in decline of motivation. If the level of success falls short of the ambition, then it may prompt greater motivation in order to reach the goal. However, if the level of success falls very far short of the ambition, this could lead to decreased motivation because the individual loses hope (learned helplessness). Thank you again for your useful comment. I agree with it. The model was intended to take your point into account already by the way success was defined here ("the achievement of a valued or desired result or state"). I'll try to make this point a little bit clearer both in the text and in the visualization. If a particular behaviour results in the achievement of a valued goal, then belief in that behaviour's effectiveness will be reinforced. Similarly, if it leads to greater social approval, then belief in the behaviour's acceptability will be reinforced. If the task is successfully accomplished, then the individual's control beliefs or self-efficacy in relation to that behaviour will increase. In fact, any new behaviours are at a disadvantage because they have not been reinforced by being linked to success. Thanks David, for again a very interesting comment! If you define success as arrival, one might feel the negative feedback you mentioned. If you define success as "speed" of movement, one might feel the positive feedback you mentioned. Another way to put it, if success is defined in term of "doing" motivation might take a hit upon DONE. If success is defined as "being", motivation might not be negatively affected by reaching a specific marker in the doing domain. Hi Peter, thanks! Good points!